WHAT: Cookie, the miniature therapy horse, will be on the University of Missouri campus to interact with students during a human-animal companion interaction class. Carol Parmenter, Cookie’s owner, will discuss the benefits of primary school children interacting with and reading to a therapy horse. WHO: “Cookie” the miniature therapy horse. Rebecca Johnson, director of the MU College of Veterinary Medicine’s Research Center for Human-Animal Interaction (ReCHAI) and associate professor for the MU Sinclair School of Nursing and College of Veterinary Medicine, teaches the course that explores the historical and theoretical bases of human-companion animal interaction. WHERE: Adams Conference Center at the University of Missouri College of Veterinary Medicine, W-203, Veterinary Medicine Building, Columbia, Mo. NOTE: Research about the health benefits of horse therapy will be discussed at the International Society for Anthrozoology (ISAZ) and Human-Animal Interaction Conference on Oct. 20- 25 at the Westin Crown Center in Kansas City, Mo. 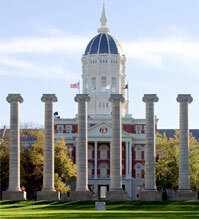 For more information or to register for the conference, visit http://www.rechai.missouri.edu/isaz_hai09.htm.